26.11.2018 - Canada's Treacherous "Faustian Bargain"
The Global Compact requires the media outlets of member-states to adhere to the objectives and refrain from any critical discussions of these objectives that would be deemed as not "ethical" and against UN norms or standards consistent with the ideology of globalism. This helps to explain the Trudeau government's generous handout to the Canadian media. In this light, the $600 million can be viewed as a form of secretive soft control and censorship, ensuring that the Canadian press abides by the requirements of the Global Compact. In response to the announcement, the heads of Canada's media organizations promptly popped open the proverbial champagne and raised their glasses to Prime Minister Justin Trudeau. Unifor, a national union that represents Canadian journalists, was even more jubilant. It felt vindicated that its slogan of "Resistance" -- which it touts as Conservative Party opposition leader Andrew Scheer's "worst nightmare" -- had so swiftly resulted in opening the government's wallet, and handing out taxpayers' money, to an industry that should actually be fighting to remain steadfastly independent of any form of government backing. This is what a "free press" is presumably all about, after all; not as in countries with totalitarian regimes, such as the once-Czarist Russia-turned communist Soviet Union-turned Putinist Russia, or Maoist China, or the Kingdom of Saudi Arabia, or the Islamic Republic of Iran, or Castroist Cuba and many third-world states in which the press is simply a propaganda tool of the government, subjected to the dictates and whim of its leader. The recipients of Trudeau's "gift" will argue that their editorial independence could not possibly be hindered -- heaven forfend! -- in such a liberal democracy as Canada. Their irreproachable backs will go up at the mere suggestion that their journalistic integrity might be compromised by entering into a financial deal with the powers-that-be. No matter how much ink they spill or bytes they waste defending their virtue, however, they will not be able to fool the public about the nature of this Faustian bargain, which is tantamount to being bought by Trudeau's Liberal Party in exchange for favorable press ahead of the next federal election. Canadians ought to recoil from this "slippery slope" to some version of a state-controlled society that this deal has created. How ironic that the announcement of the media bailout came less than a week after the 100th anniversary of the First World War armistice and Remembrance Day, during which Canadians honored the memory of countrymen killed and maimed in wars fought for freedom against the advance of tyranny. Perhaps this deal should not have come as a surprise, however, considering Trudeau's stated position that Canada is a post-national state with no core identity. In other words, in Trudeau's Canada there is no tradition to revere, no sacred values to defend and no identity to preserve. Trudeau, it seems, adheres to the principle of globalism, according to which the world is borderless, and the idea of sovereign nation-states is both reactionary and obsolete. In this borderless world, the governing body is the unelected, untransparent, unaccountable, corrupt United Nations and its agencies, which possess the authority to legislate international law that is then enforced by member states. Trudeau appears determined to turn Canada into a laboratory of the globalist agenda. This is probably why he is rushing to embrace the UN-proposed Global Compact for Safe, Orderly and Regular Migration, to be adopted at the Intergovernmental Conference in Marrakech, Morocco, on December 10-11, 2018. Most Canadians are unaware of the content of the Global Compact, which their government has committed to sign. Yet it is in the context of this agreement that various decisions taken by the Trudeau government can be explained -- decisions on issues such as immigration, climate change, "Islamophobia" and the $600 million media bailout. The Global Compact is a document detailing the requirements for member-states to adopt as policy that amounts to unfettered global migration. Trudeau has bought into this UN agenda and has decided to impose it on the Canadian people without their prior knowledge or consent. Translated from UN-speak, this means that media outlets of member-states are required to adhere to the objectives adopted in the Global Compact, and refrain from any critical discussions of these objectives that would be deemed as not "ethical" and against UN norms or standards consistent with the ideology of globalism. This helps to explain the Trudeau government's generous handout to the Canadian media. 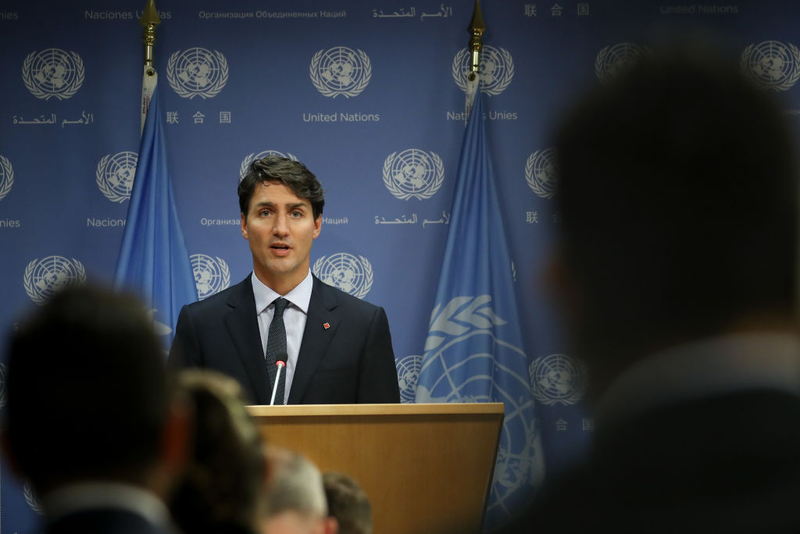 In this light, the $600 million can be viewed as a form of secretive soft control and censorship, ensuring that the Canadian press abides by the requirements of the Global Compact. In accepting the money, the Canadian media as a whole becomes no different from the national public broadcaster CBC, all of whose news and opinion are slanted to the center-left, espousing the Liberal Party's political, economic and cultural positions – with an occasional token and highly controlled conservative view in the mix for the purpose of maintaining the façade of free speech. The gradual elimination of free speech is characteristic of the Trudeau government, which last year adopted parliamentary motion M-103, condemning any critical discussion of Islam and Muslims as "Islamophobia." "Islamophobia," in UN-speak, is bigotry and racism, and could be subject to censorship or liable to criminal prosecution under the "hate speech" provision of the human rights commissions in Canada. This is consistent with the recent ruling by the European Court of Human Rights, that criticism of the Prophet of Islam is tantamount to inciting hatred and is not, therefore, protected free speech. It is also consistent with the effort of the Organization of Islamic Cooperation -– the largest bloc of 57 member-states in the UN -- to declare any criticism or insult of the founder of Islam and the religion itself as blasphemy in accordance with Islamic shariah law. There is a pattern emerging that indicates the sort of country that Trudeau and his Liberal Party are trying to create: a borderless Canada where UN-devised international law will take precedence over legislation enacted by elected representatives of the Canadian people who go against it. If this process is not reversed, Canadians -- inundated by mass-migration -- will become citizens of the world; and Canada will become a multicultural North American protectorate of an emergent 21st century, UN-administered borderless world. In such a world, there is no room for freedom of speech or a free press. The Canadian media should think long and hard before selling its soul to Trudeau. Salim Mansur is a Distinguished Senior Fellow at Gatestone Institute. He teaches in the department of political science at Western University in London, Ontario, and is the author of "The Qur'an Problem and Islamism"; "Islam's Predicament: Perspectives of a Dissident Muslim"; and "Delectable Lie: A Liberal Repudiation of Multiculturalism."